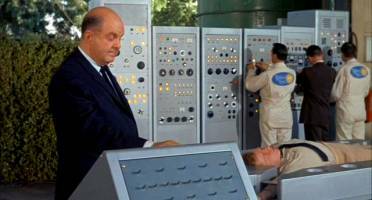 Espionage agent Alexander Corby kidnaps Randolph Lipscomb from NIMR's doorstep for his knowledge (The X Factor) of a secret deterrent weapon. Corby uses a process to put Lipscomb in suspended animation like a life-sized toy for exportation to his home country. Nelson and Crane and Intelligence Captain Shire become suspicious and after circuitous plot twists, arrange through government channels, to have an inspection of the Kaber Toy Company -- Corby's business cover and location for his shenanigans. As they head to LA for the inspection, their car is attacked by helicopter, Shire killed and Nelson captured. 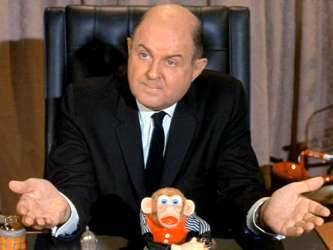 John Mcgiver as Alexander Corby. Corby officiates the preparations for Nelson's toyification, after which he'll be exported to Corby's homeland. As was the case with many season 2 episodes, "The X Factor" features loads of location filming, in this case, to the exclusion of any new model work. The miniature effects department got the week off, so to speak. Nelson is hustled off to the Kaber Toy Company where Corby immediately starts the conversion process on the Admiral but is disrupted by Captain Crane, Sharkey and Riley, who have been on Nelson's trail. 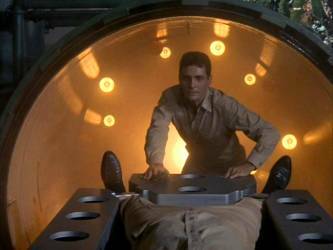 Nelson is freed, and Corby, hiding in the conversion tank, is inadvertently subjected to his own process and converted into a Kaber Toy. 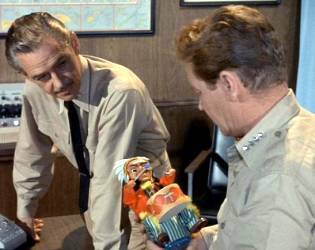 William Hudson and Richard Basehart with Kaber Toy. Corby meets his own frozen fate. Mark Says: Crazed toy manufacturers make for boring villains! Still, their desperately antic efforts to kill Admiral Nelson are so comic-strip in nature that it provides some brief fun. William Hudson, who was killed off as Captain Phillips in the pilot, returns here so that he can die in a "stock footage" death. Hudson gives a likable but fascinatingly stilted performance. Some sloppy direction as kidnappers noisily grapple with Liscomb while an oblivious MP stands in the background. 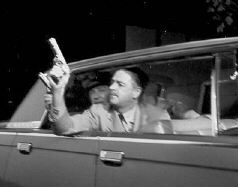 Bill Hudson rehearses firing (at helicopter) as Richard Base-hart looks on from the back seat in this rare studio production shot. Final footage would have rear screen background rolling behind vehicle. Footage was shot in color for Voyage's pilot episode and reused in season two's "The X Factor. " Mike Says: Part of the challenge in doing these reviews is to be honest. This show didn't particularly work for me. 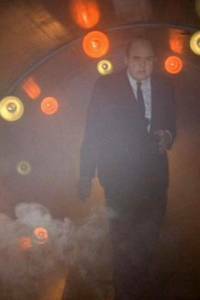 On first viewing during its original network run, I felt the whole thing was overly contrived, as were many of season two's spy shows, that Voyage was trying to copy The Man From UNCLE , but without the tongue-in-cheek wit. The blatant use (or re-use might be a better way to put it) of the X-marks-the-spot car-chase scene with Bill Hudson was kind of a shock, even back then. Repeated use of a generic effects sequence, such as the Flying Sub docking, does not cause the negative kind of kick to the groin that reuse (even just once) of a stand-out set-piece like the helicopter chase scene does. Director Leonard Horn seems to have adapted to the lazier pace of the color episodes, at least for this outing.